流媒体技术世界——分享技术，增值服务。Wowza Media System LLC,.中国大陆地区授权代理商，Intel MediaServerStudio 和 MediaSDK 中国大陆地区授权代理商 采用Wowza Stream Engine 4作为流媒体服务器时，如何配置一个直播流repeater(中继)? 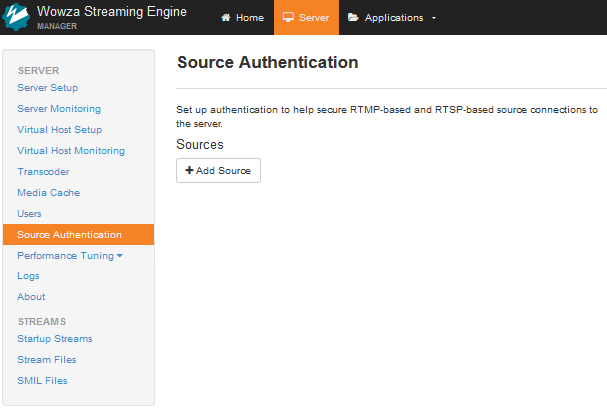 在Wowza origin 服务器上，首先确认Wowza Streaming Engine Manager 处于正常运行状态。请参考如何启动和停止Wowza Streaming Engine软件. 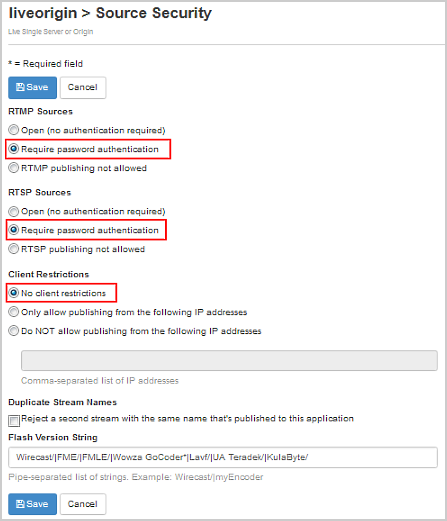 在RTMP Sources下, 选择 Require password authentication. 在RTSP Sources, 选择 Require password authentication. 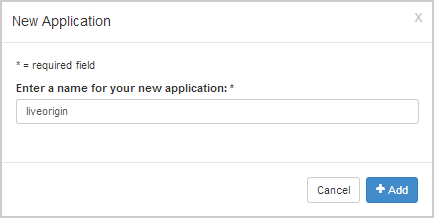 在Client Restrictions, 选择 No client restrictions. 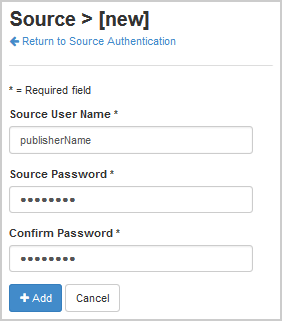 在Source Authentication 页面，输入Source User Name 和 Password, 然后点击 Add. 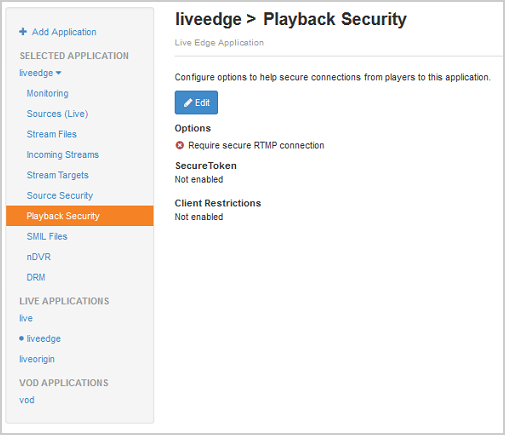 在Wowza边缘(edge)服务器上，首先确认Wowza Streaming Engine Manager处于正常运行状态。请参考如何启动和停止Wowza Streaming Engine软件. 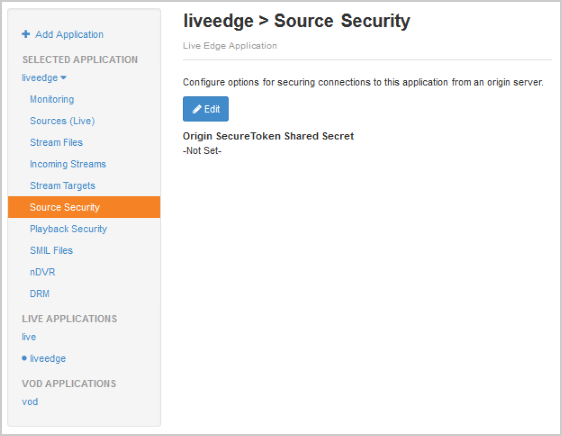 在Applications 菜单，点击Add Application, 然后在点击Live Edge application type. Primary Origin URL 和可选的 Secondary Origin URL 必须使用这些URL前缀: wowz://, wowzs://, rtmp://, or rtmps://. SSL 验证必须来自一个证书颁发机构(请参考如何从一个证书颁发机构申请一个SSL 证书)。自签名的证书是不支持。 但Wowza完全支持Wowza StreamLock™ 认证(请参考How to get SSL certificates from the StreamLock service). 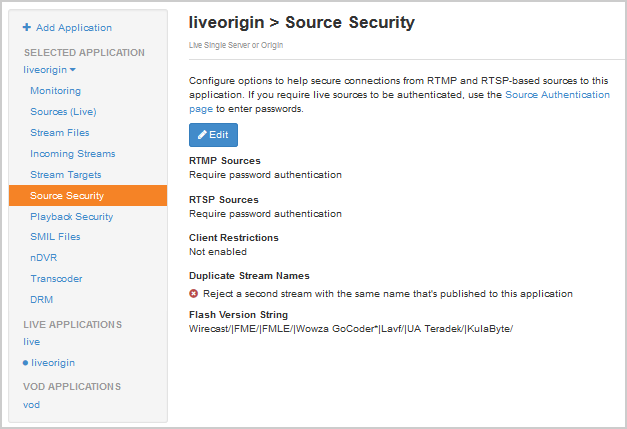 在Wowza origin 服务器上创建一个配置文件夹[install-dir]/conf/liveorigin 并将 [install-dir]/conf/Application.xml 拷贝到这个新的文件夹下. 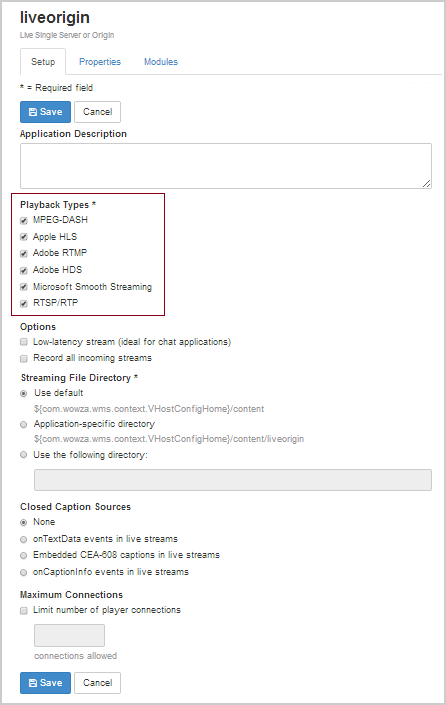 直播流进入Wowza Stream Engine 4 后，如要通过HTTP协议对外提供流媒体服务，则必须先经过打包(packetized)处理。这些基于HTTP协议的流媒体播放技术包括Apple HTTP Live Streaming (Apple® HLS), Adobe HTTP Dynamic Streaming (Adobe® HDS) 及 Microsoft® Smooth Streaming。 在Application.xml的<Streams>/<LiveStreamPacketizers> 中列出了系统在对直播流进行打包时需要支持的Http流媒体协议对应的打包器。它有2种类型的打包器:streaming packetizers 和 repeater packetizers. 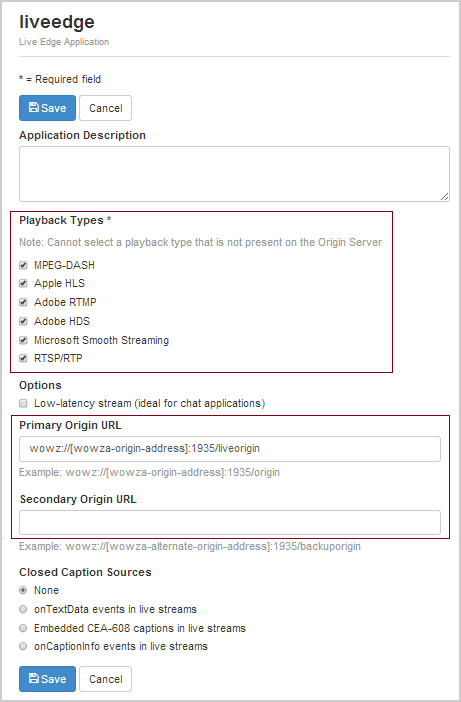 在直播流中继架构(origin/edge)下，streaming packetizers 被用于从Wowza origin服务器向Wowza edge 服务器传输直播流。 在源(Origin)服务器的Application.xml的<Streams>/<LiveStreamPacketizers> 列表中可以包含从零到一个或多个下面的streaming packetizers. 在直播流中继架构(origin/edge)下,Wowza edge 服务器上的Http流媒体打包器需要被设置为对应的repeater打包器。 在边缘(edge)服务器的Application.xml的<Streams>/<LiveStreamPacketizers> 列表中可以包含从零到一个或多个下面的repeater packetizers. 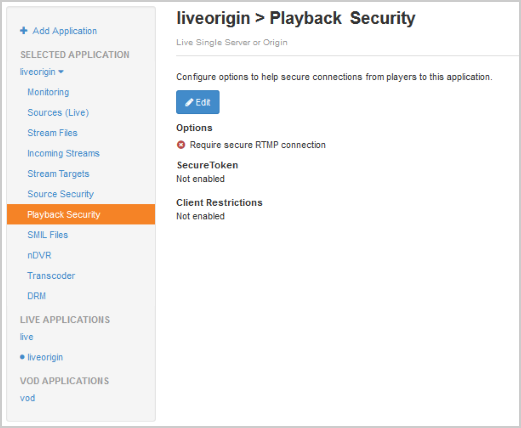 在Applications 菜单的 liveorigin应用下，点击Playback Security, 再点击Edit. 在Wowza边缘服务器上，启动Wowza Streaming Engine Manager管理界面。请参考如何启动和停止Wowza Streaming Engine软件. 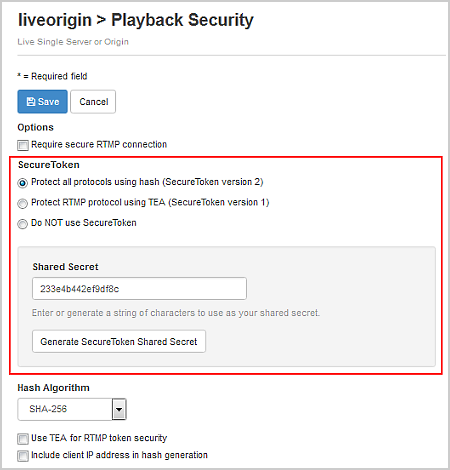 若要用Secure Token 功能来组织未经授权的播放器播放边缘服务器上的流，请点击Playback Security, 再点击Edit. 请参考在播放Wowza的输出流时，如何使用Secure Token 对播放URL做验证？ to create a shared secret. 要让这个机制正常工作,你的Flash播放器必须在与服务器建立连接后，向服务器返回SecureToken。要了解更多如何在JW Player中使用它，请阅读 How to add SecureToken Protection to LongTail JW Player 5.